Vegan Eats and Treats! 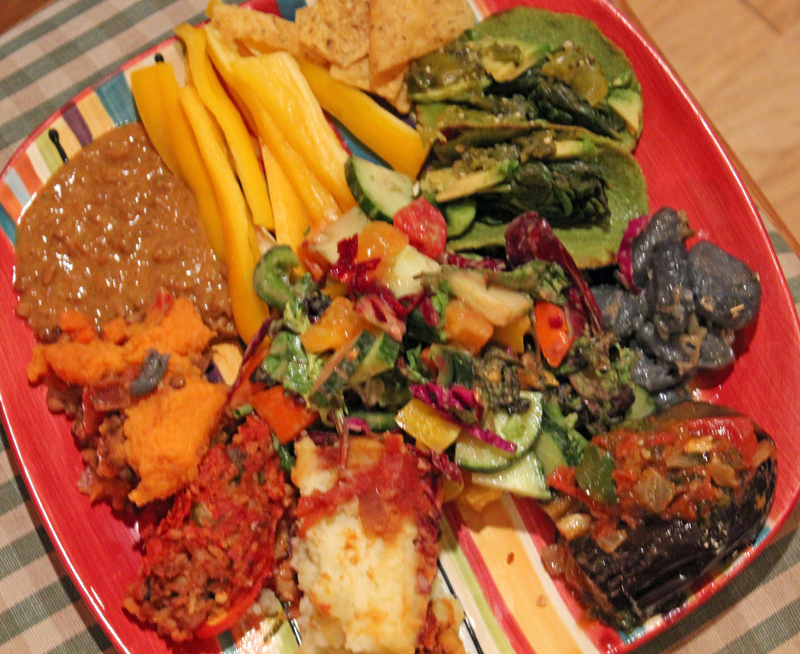 : Return of the Double Rainbow Potluck! Return of the Double Rainbow Potluck! 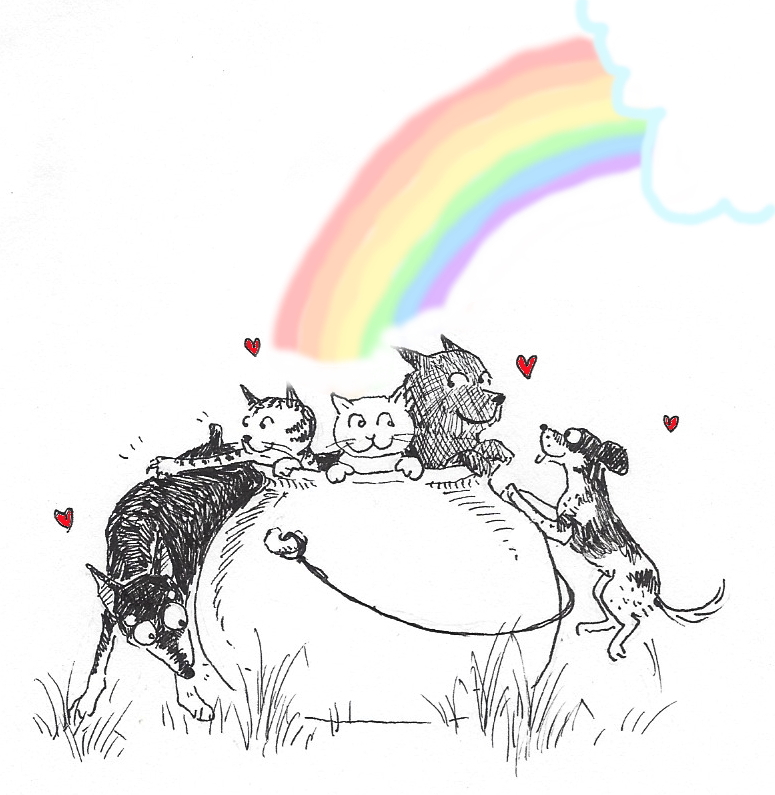 I'm sure you can see from the title drawing for my blog that I really love rainbows. When I was kid, I always arranged my candies in rainbow order before eating them. Up until fairly recently, I kept my sock drawer arranged in rainbow order. So, this rainbow-appreciation runs deep with me. 4th Annual Double Rainbow Potluck! 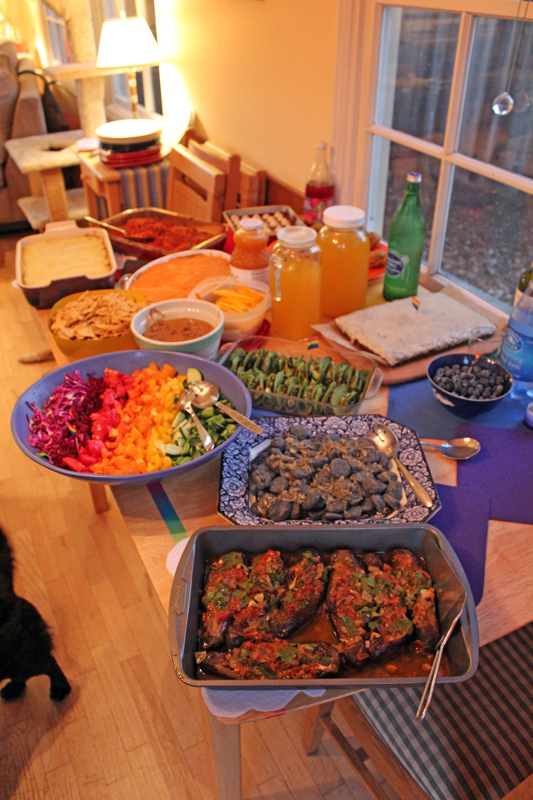 Inspired by the glory of nature's colorful bounty this time of year, my pals and I held our first Rainbow Potluck way back in 2010. We skipped a year in 2011 (why!? ), but now we are fully committed to making this excellent culinary spectacle a yearly event. Just what makes it a Double Rainbow Potluck, you ask? Well, we have the full rainbow spectrum represented in both savory dishes and in desserts. It is quite an undertaking! Well ahead of the gathering, people have to commit to their color and flavor spectrum - for example, I signed up for "Green Savory," and Mr VE&T signed up for "Red Savory"... until bit by bit, you've got red-orange-yellow-green-blue-violet in both sweets and savories all signed-up-for. It's so fun! Without further ado, get ready for a colorful blast of food photos! This was Mr. VE&T's first time ever actually cooking a dish for a potluck, and it was really awesome! I helped him a little - but mostly just with finding where I keep things in the kitchen. This recipe is from Julie Hasson's new Vegan Casseroles book, and you'll be hearing more about it soon - it's super easy, very tasty, and also extremely red! Our friend Jamboxrocks made a long-distance drive to come to the potluck, which was really special because I hadn't seen her in ages and she is very cool. Plus, she is a great cook - so that's an extra bonus! She made this delicious Shepherd's Pie - and what you can't see here is the lentil-veggie filling. The whole thing was very delicious and I went back for seconds. She even left us with some of the leftovers and we were both stoked! 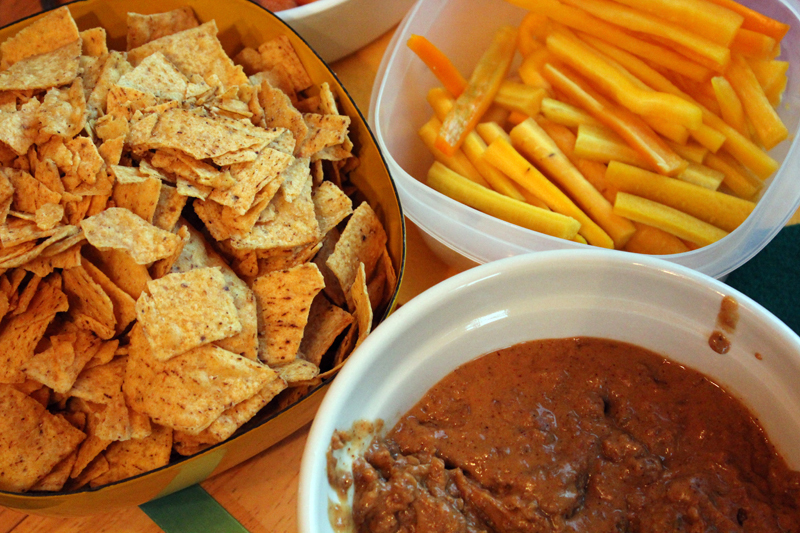 Solipsistnation made a very rich and spicy, and "dark yellow" Nacho Dip. I don't know what all was in it, but it was really good! 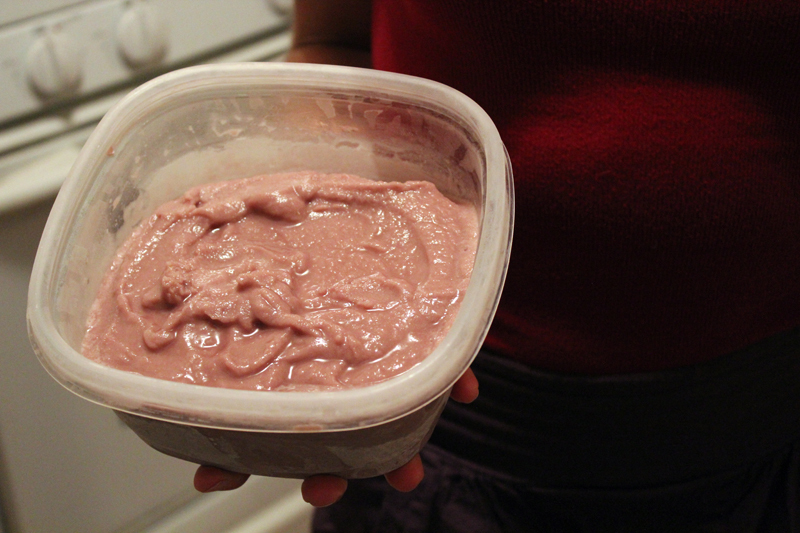 It was a little chunky, thick and dippable and had just the right amount of spicy flavor without being overwhelming. I also loved the yellow veggies - yellow carrots are special! I was in charge of Savory Green, so I decided to make Green Tacos. First, I decided that the corn tortillas had to be green. I went looking online and found nothing helpful at all, which seemed totally surprising. Then, I looked in my brand new copy of Vegan Tacos, by Jason Wyrick and didn't see any green tortilla ideas. So, I sent him a Facebook message and asked for advice. In the end, I combined my idea and his idea and had great success! I charred (then peeled) two poblano peppers (Jason's idea), and steamed a big handful of spinach (my idea). I pureed the poblanos and spinach with some of the water from steaming the spinach and used that for the liquid in the tortillas. I used the recipe and instructions from Vegan Tacos, which were easy and clear. This was my first time ever making corn tortillas! They came out great! As you can see, they are super green. Also, they had a perfectly present poblano flavor, and even a little spicy kick. They didn't puff up, the way the book said they might, but they were soft and tasty and I was totally pleased. I do not have a tortilla press, so this drawing shows the sophisticated method I used. I put the little wad of tortilla masa between two sheets of waxed paper, and put all that between two of my thickest cookbooks ("How to Cook Everything Vegetarian" and "Madhur Jaffrey's World Vegetarian," if you must know). 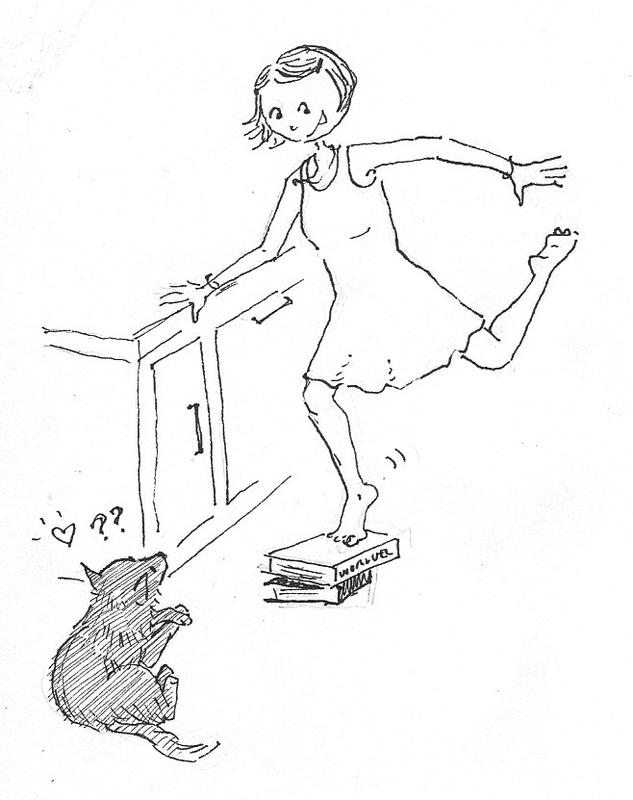 Then I stood on the top book with one foot and pressed down solidly and evenly. It worked just fine! I also used Vegan Tacos to make a homemade batch of Salsa Verde - with tomatillos, charred poblanos, cilantro and some other stuff. This was my first time ever making green salsa, and it was so fun! I always love Salsa Verde, but usually I just buy it. 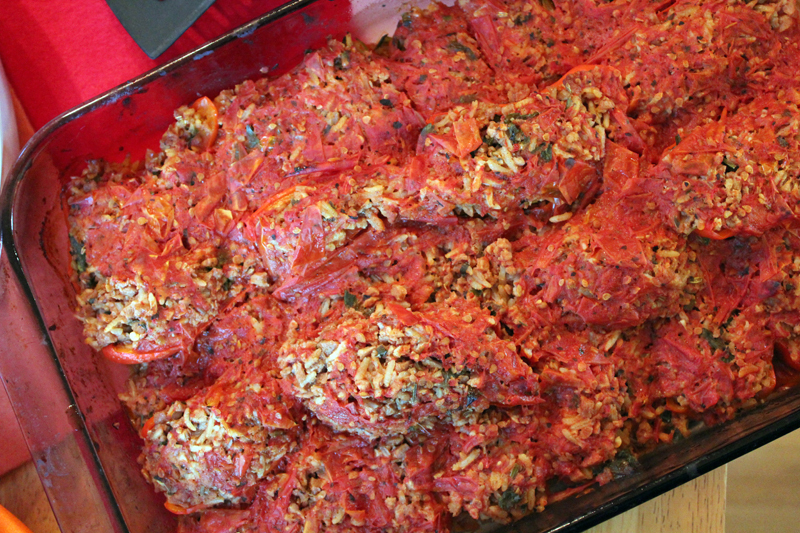 It was actually pretty easy and was also extremely delicious - way better than the store bought stuff!! Green Savory: Mini Green Tacos! 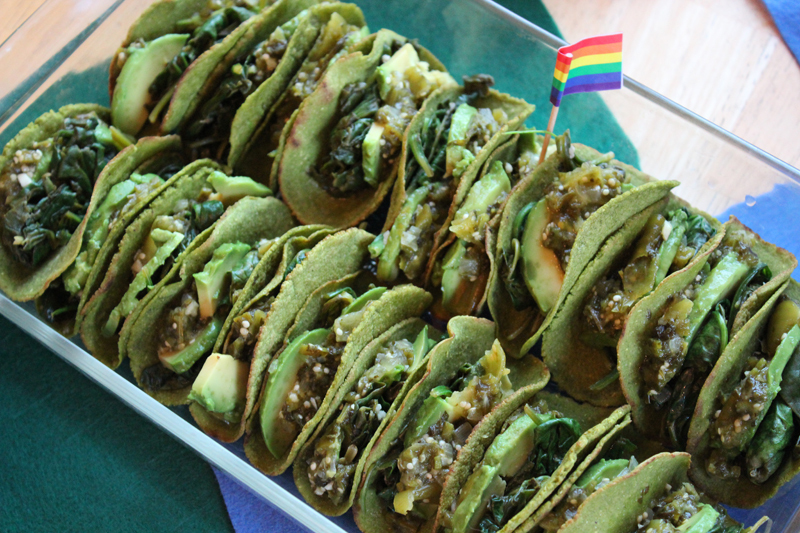 Green corn tortillas stuffed with garlicky sauteed spinach, slices of fresh avocado, and then topped with salsa verde. It was hard to figure out how to serve a giant batch of mini soft tacos - but smooshing them all into pyrex casserole dish ended up working out pretty well. I was really happy with how these turned out, and I definitely look forward to more taco adventures with the new Vegan Tacos book. Oh my goodness. Can you even believe it? First of all - they really did turn out blue! Secondly, they were also extremely delicious. 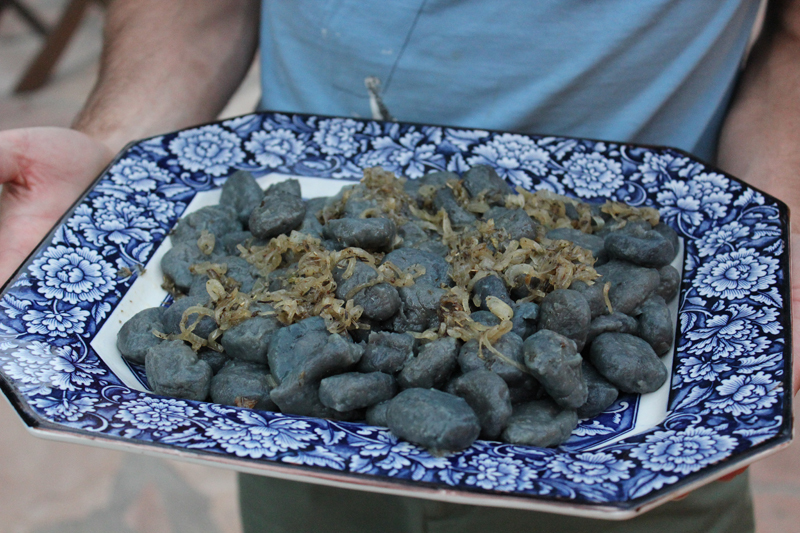 Max made a big batch of gnocchi using purple potatoes, and with the help of a little food science, got them to turn blue. But they were also just very tender and fresh little gnocchi gems of starchy goodness. The shallot dressing was such a nice flavor and didn't detract from the blueness of the gnocchi at all! Oh man, don't these look amazing? Well guess what? They were! 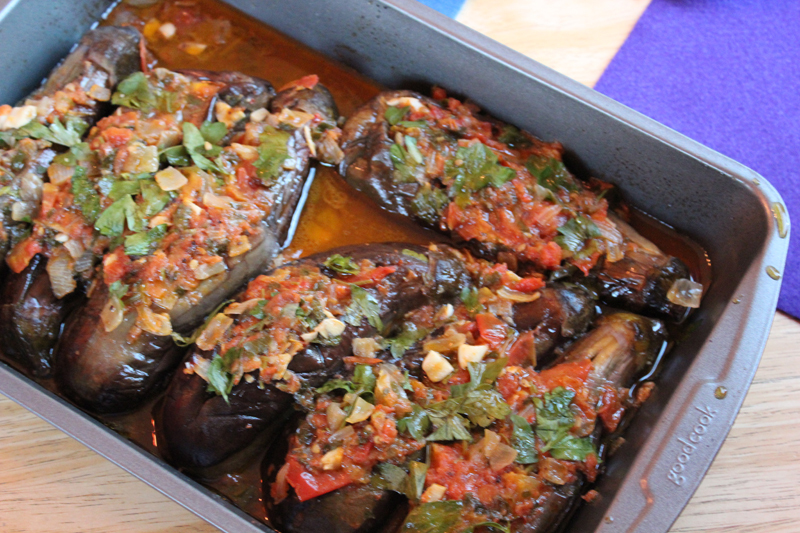 These were long eggplants stuffed with tomatoes and garlic and herbs and they were lovely. Even though they looked so perfect like this, we cut them in half for the sake of trying a little bit of each of the dishes. A long time ago, we collectively realized that you must have a giant green salad at every potluck. It feels so good to eat some salad along with all the other special foods. 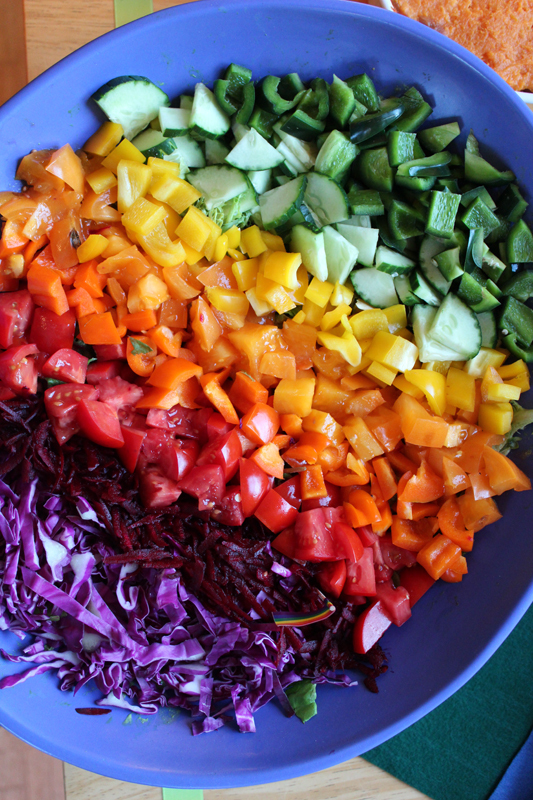 Plus, for a rainbow party, the salad is an obvious must! I had so much fun making this beautiful salad. Underneath that colorful array of veggies was a giant heap of pre-dressed lettuce and greens. So fun to arrange all the veggies in order. 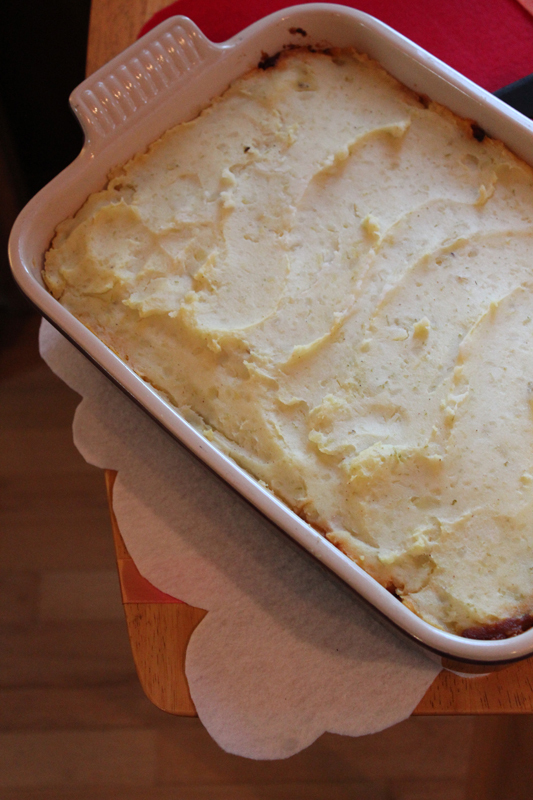 Instead of puffy white clouds at the end of our rainbow, we had a puffy white casserole dish! This had a mexi-beans base with lime-scented mashed potatoes on top. I think Ms.A said it was a PPK recipe? 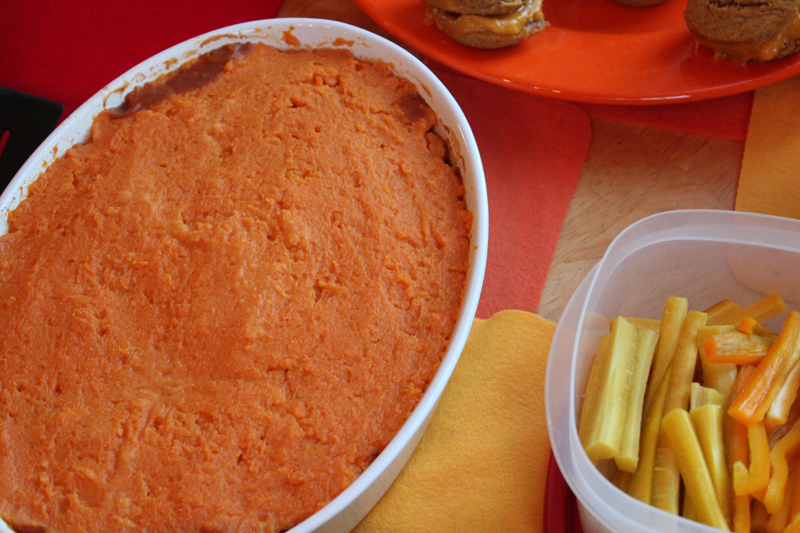 It was a nice mix-up of two familiar casserole favorites. The mashed potatoes were super good with the lime in them! It's hard to capture just how red these were! 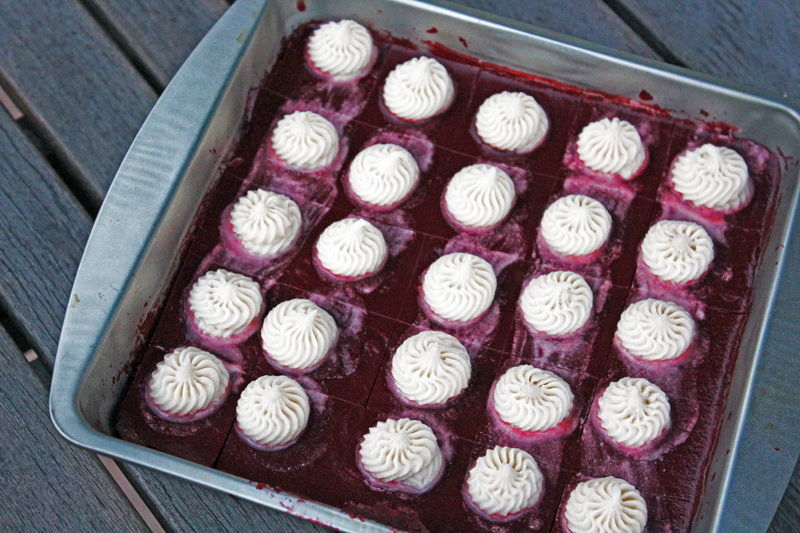 The main flavor was definitely raspberry, but some of the deep red color comes from beets. Underneath the red stuff was a chocolatey cake/crust. The recipe comes from Hannah Kaminsky's pie book, and these were really good. In fact, just looking at this picture made me go get one of the left over bars out of my fridge right this moment and eat it. Damn that's good! Whoopie! 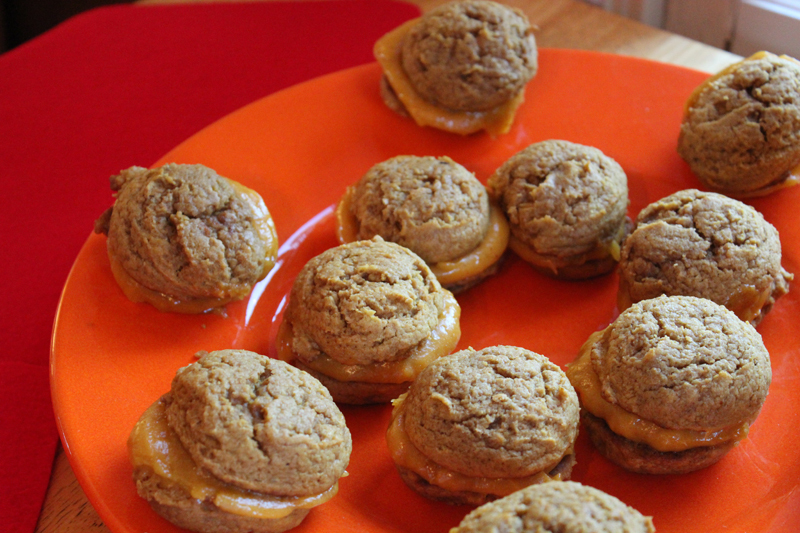 Big cakey cookies with pumpkin-marshmallow filling! Apparently, the filling was made with just melted-down Dandies marshmallows and pumpkin puree, and it had a great flavor and a great orange color. Our tiniest party guest was absolutely smitten with these, and by the end of the party, he was camped out by the edge of the table, up on his tip toes, turning the platter to try to access the last of the Whoopie Pies. Ha ha. Sadly, he was foiled by alert parents! Damn this stuff was good! 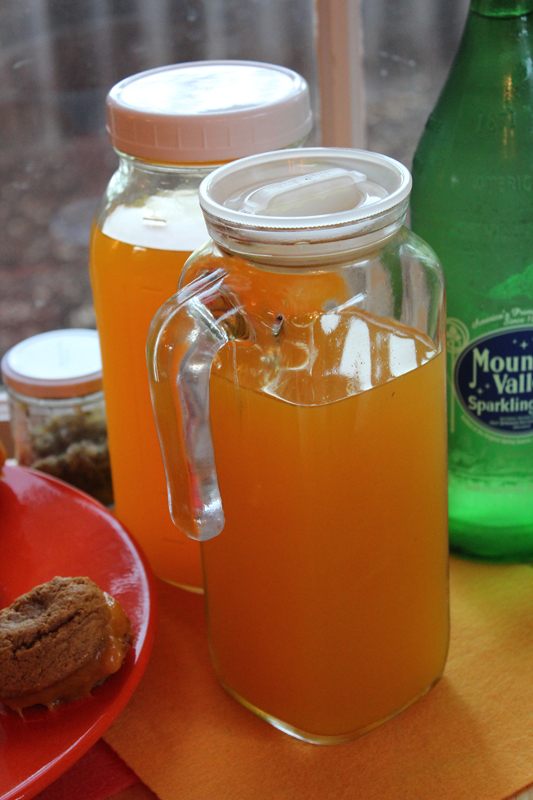 Ms. A said that she found raw fresh turmeric and infused it into the simple syrup, and used that to make the lemonade. And that now her entire kitchen was stained yellow. A while back my aunt gave me a bunch of really amazing Turmeric drinks and I totally fell in love with them - and then realized that they cost about $7 at the store. So sad. Well, this delicious lemonade really reminded me of those drinks and made me think maybe I could make some on my own. I loved the turmeric flavor and it was a great idea to combine it with lemonade. You heard right, Kale Cake! What will vegans think of next?! Well, you can't see it - but this cake really was quite green on the inside. Believe it or not, this cake had one entire bunch of kale in it - and it was so delicious. It was sorta like zucchini cake or carrot cake - a lovely spice cake that is secretly stuffed full of veggies. When we cut into it, the inside was actually full of little green flecks - which was really fun. A totally good and delicious spice cake! The truth is, no one signed up to bring a blue sweetie. I get it - blue is pretty tricky. But I couldn't stand to neglect such a lovely part of the rainbow palette, so I ran out and bought a couple of tubs of blueberries. Is that a lazy move? Maybe. But hey, I was busy making green tortillas! Plus, in truth, most of the time all this beautiful produce is pretty spectacular all on its own and really doesn't need to be enhanced in order to shine. Suffice it to say, there were no blueberries left at the end of the evening. This is not a good picture, but this was some very delicious ice cream! I think Sophia said it was a vanilla ice cream base, made with port wine. I'm not a big alcohol fan, but I really like boozy desserts for some reason. This ice cream totally knocked my socks off! The rich and earthy port was a great combo with the sweetness of ice cream. Because of the alcohol, it was super melty, but that didn't stop us from gobbling it down. 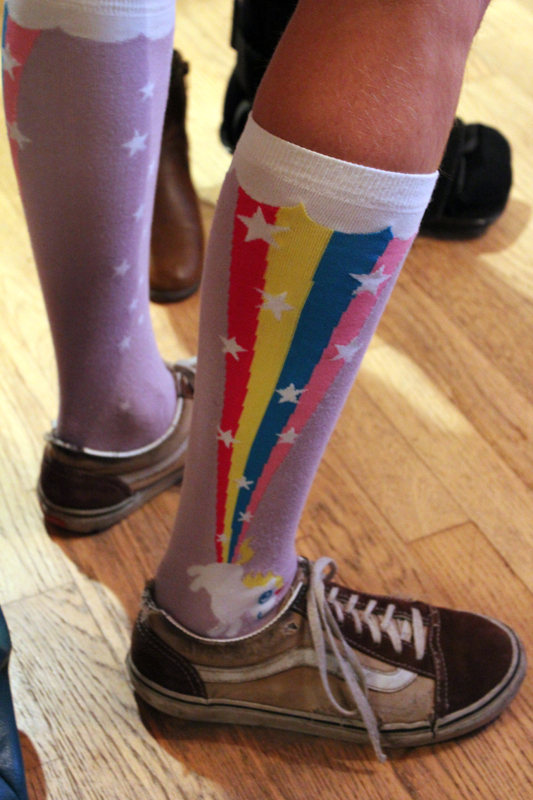 Sophia sportin' the rainbow unicorn socks! I need to buy a good pair of rainbow socks. My lack of silly rainbow attire for the Rainbow Party was woeful. However! We did each wear our color - so, since I brought "green savory," I wore a green tshirt and green jewelry. We have a little potluck tradition amongst our pals where before anyone eats, we all stand around the table and tell each other about the dishes we brought. It's a fun way to start, and it's nice to give everyone a chance to talk about their culinary creation. my dinner plate, in rainbow order of course. Sorry the picture is blurry, but I think I was in a manic rush to eat. Who has time to properly focus the camera at a time like this?? Again, a blurry picture. I could take the high road and blame this on the lack of natural light by this point in the evening, or I could be more honest... and just confess that I was probably a bit too eager to get to that melting ice cream before it was too late! Can you see the green flakes in the kale cake in this picture? treasures at the end of the rainbow! 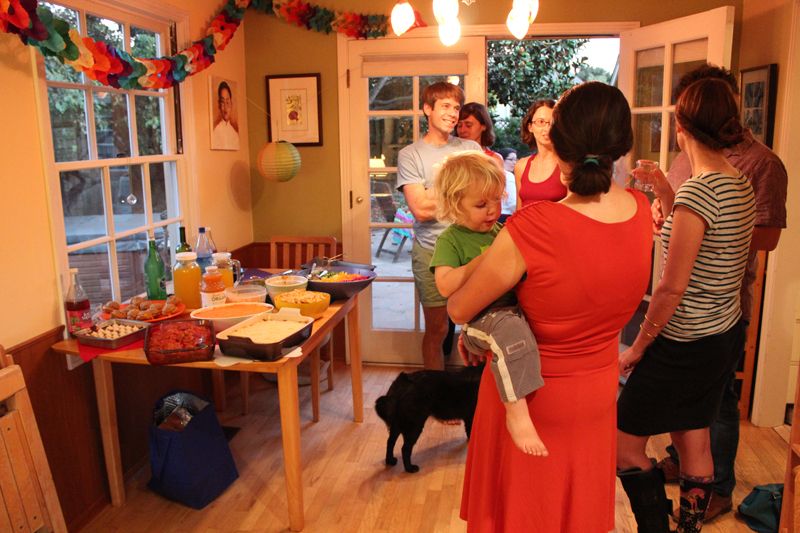 All in all - another super wonderful Rainbow Potluck! Great food, beautiful produce, delicious creations, good friends, and a lovely evening. Hoorah!! Awesome pot luck theme, a color explosion! I make a quick turmeric drink with water, apple cider vinegar, ginger and stevia. I've resorted to pressing tortillas between cutting boards. I love how your pooch is simultaneously adoring and bewildered. Your potlucks are the best! I really love all the ideas you came up with. Those green tortillas sound fabulous. I wish I could sort my socks in rainbow colours but it seems I only have black ones. Better go shopping for some new socks. Wow! What an amazing tradition! I am going to suggest it for a family event if you don't mind ;) Those green tacos look amazing!! Yay, rainbow party time!! I always love these posts. Everyone always makes such amazing, pretty dishes. I actually love the idea of a green kale cake (oh, vegans!) and I love your tortilla press idea and the look of the blue gnocchi and the sound of turmeric lemonade and one year I'm totally gonna gatecrash this party!! Wow. wow. wow. I love the rainbow potlucks. And so many great, inventive ideas here that I can't wait to try. I just got Vegan Tacos and am really excited about it. 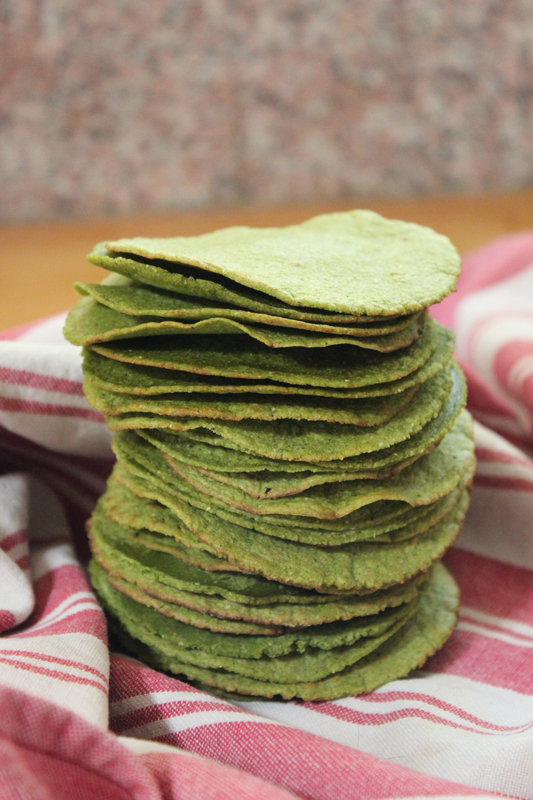 So cool that you came up with the green tortillas with the author! I like your little rainbow flags. 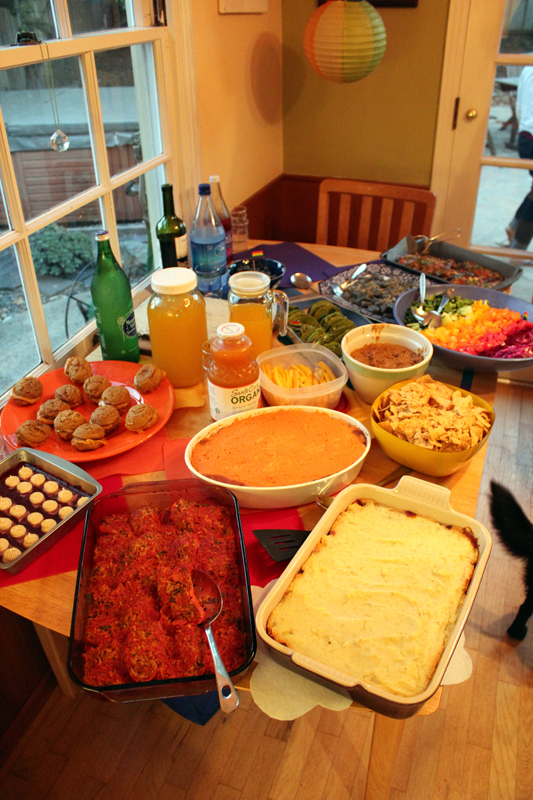 You have the best potlucks, this all looks so beautiful. Only 10 comments for this incredible post? Hey everybody, wake up! 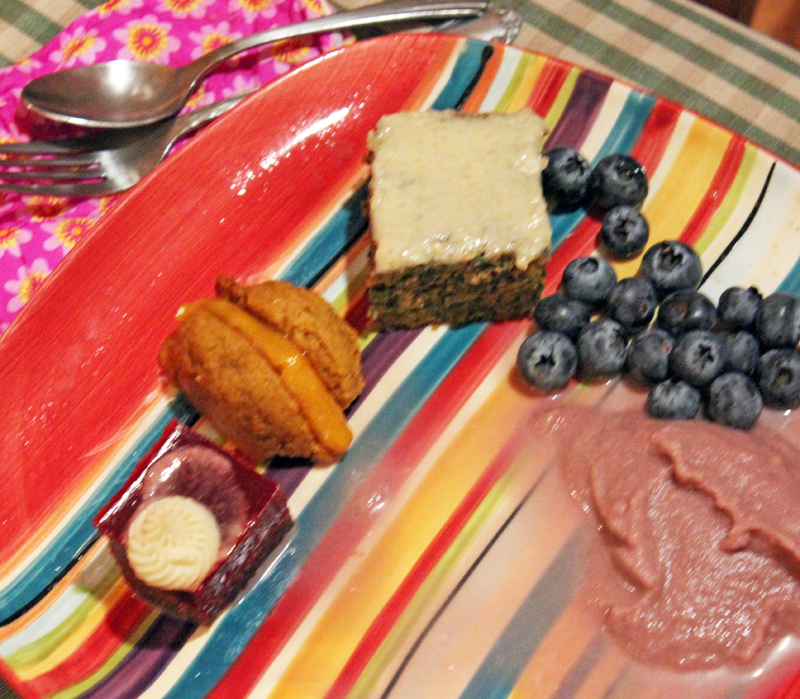 I absolutely adore your rainbow potlucks, and I'm not just saying that because you tried my crazy beet and berry recipe! 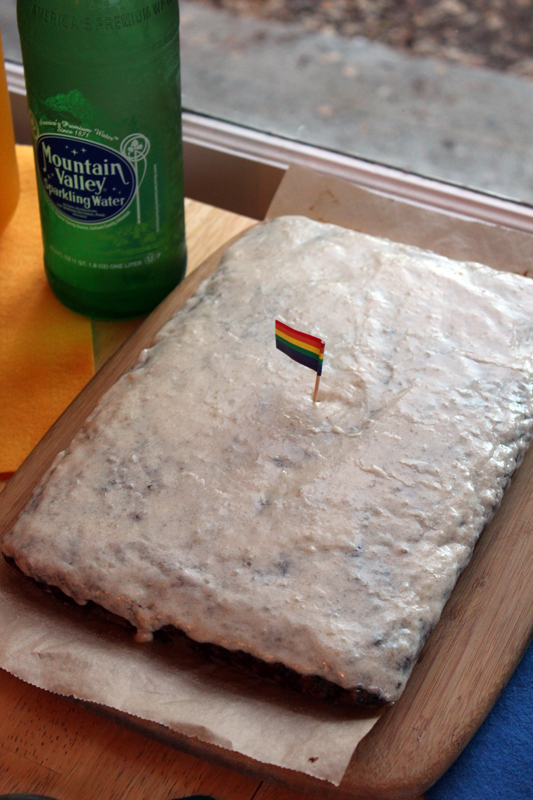 ;) It's such a fun theme and smart idea, I might just have to launch my own edible rainbow celebration around here. This is amazing! It looks like such a delicious event, and a FUN theme. This is such a great tradition and I'm glad we get to read about it every year. I would love to load my plate full of a bit of each of these beautiful dishes. 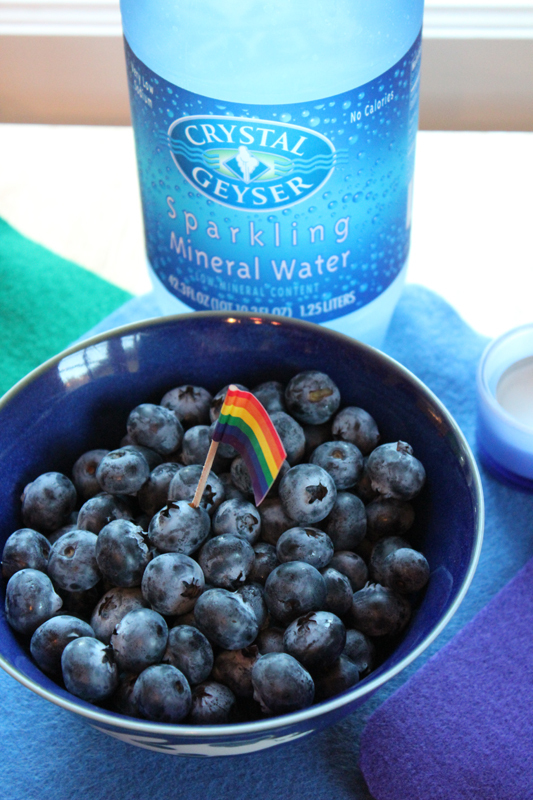 And I don't think the blueberries are much of a cop-out at all; it's not your fault that they're at their bluest and most delicious when they're in their natural form!